ONE OF the key figures in Yorkshire’s devolution debate has insisted West Yorkshire council leaders will not be rushed into a deal with George Osborne and rejected suggestions the area is falling behind Manchester. West Yorkshire Combined Authority chairman Peter Box acknowledged ministers were likely to push for a deal to take on new powers in return for creating a new elected mayor to be completed before the Budget in March, but maintained he was “relaxed” that other areas were already moving forward with devolution plans. The Chancellor has struck agreements with groups of councils across the North, including South Yorkshire, to hand over powers and cash from Whitehall. 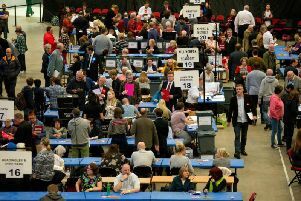 But West, North and East Yorkshire have failed to reach agreement as councils argue over the best way forward and have presented a range of competing proposals to the Government. West Yorkshire councils are pushing for a devolution agreement covering themselves and neighbouring Harrogate, Craven, York and Selby, an area branded the Leeds City Region. The principal rival proposal, known as Greater Yorkshire, would create a single area wielding devolved powers across the West, North and East. Coun Box said: “Clearly we need to try and make sure we come to a view as quickly as possible. We believe the Government would like a deal in place before the Budget. “We haven’t been complacent, we haven’t been sitting back and doing nothing, we’ve been trying to get the best deal that gives us more devolution and allows us to do more things to grow our economy. Coun Box was referring to the agreement struck with the Coalition Government before the General Election which he argued was often overlooked. Greater Manchester councils were the first to agree a devolution deal in 2014 and have subsequently been handed further powers by the Chancellor prompting some in Yorkshire to suggest the region is in danger of falling behind. “Everybody says Manchester is leading the way. We think in West Yorkshire through the Combined Authority we have picked up the pace tremendously. I think some of the successes we have had stand comparison with Manchester. One of the main arguments put forward by Greater Yorkshire supporters is that carving up the region would damage the region’s ability to capitalise on the Yorkshire brand. But Coun Box insisted the two issues were separate. Earlier this week, former deputy prime minister Lord Heseltine used a speech in Leeds to urged Yorkshire council leaders to find a way to end the deadlock over devolution.